1,013 people read this post. Gossiping and slander has become such a norm within our conversations that we often we fail to realise its seriousness. Guest contributor, Saajida Malvina reminds us. “Hey, have you heard, Zaeem didn’t go to see Hannah!” said Rayaan. “Seriously?” asks Hamzah. “Yes, actually Hannah is going out with Yusuf – and – chatting to few other guys including Ziya and Muneer,” says Hamzah giving away some gossip he heard as a matter of fact. “Oh My Word” and here we all thought Hannah was such a good girl, a perfect burqini babe” exclaims Hamzah agitated. Above, a typical conversation between two guys oblivious of the fact that they have committed several sins including gossiping, exposing the sin of another Muslim and passing judgment. If the rumours are false, then the sin is worse and slander has just been committed. Slander is such a serious crime that it is punishable up to 80 lashes. The Qur’an has warned too against disgracing a Muslim and rhetorically ask a person: “Do you like that he eats the flesh of his dead brother?” – Chapter 49.12. Likewise, numerous ahadith of the Prophet (pbuh) have been narrated in this regard including the most famous Hadith: “Backbiting is worse than adultery.” Scholars have deduced that whilst adultery is punishable with stoning to death or hundred lashes depending on whether the person is married or not, adultery is worse because a person committing adultery has wronged our Creator whilst an actual person is wronged in the case of ghibah – backbiting. Hence, seek forgiveness from your Maker and you shall be pardoned; but if you wrong a human and seek his forgiveness there is no guarantee he will pardon you, and not seek justice on the Day of Reckoning. – It could be a test from Almighty Allah and a means of you gaining His proximity. – People cannot see others successful without being jealous and harbouring ill feelings, hence they try to name and shame people. – If a person perceives one to be successful, they try to demoralise and demotivate a person from achieving their goals. Scholars receive many queries from youth especially girls who are concerned about their reputations being tarnished via rumours. My advice is do not be grieved. In the annals of our history, the beloved wife of Muhammad (S), Ayesha (ra) was accused of adultery by hypocrites in Madinah. This could have been considered a golden period of Islam. After more than a month verses were revealed exonerating her, and those who had accused her or spread the rumours were reprimanded and the command was ordered for them to be punished. If people in the golden period of Islam did not leave the Prophet (S)’s wife then why not attack ordinary mortals like you and I? One should try and recite the Manzil or the 3 Quls to protect oneself from the evil eye. Promise yourself to be so strong that nothing disturbs your peace of mind. Don’t grieve or become upset as you are only satisfying the person who spoke about you. 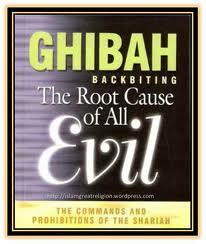 Is gheebah permissible at times? Gheebah, speaking ill of someone behind their back, will only be permissible in extreme cases, for example a problem needs to be solved and to be directed to the correct channel for it to be solved. Other reasons are to testify in court, or to bring about justice. Also, if a person is interested in an individual for marriage purposes, then it’s recommended to speak the truth.